(Nanowerk News) Graphene consists of a two-dimensional carbon layer in which the carbon atoms are arranged on a hexagonal lattice, resembling a honeycomb. Carbon nanotubes are rolled-up sheets of graphene, and thick piles of graphene sheets form graphite. Together with colleagues from the Max Planck Institute for Polymer Research in Mainz, scientists from Empa’s “[email protected]” laboratory have for the first time succeeded in synthesizing a graphene-like polymer with well defined pores. To achieve this feat the researchers allowed chemical building blocks of functionalized phenyl rings to “grow” spontaneously into a two-dimensional structure on a silver substrate. 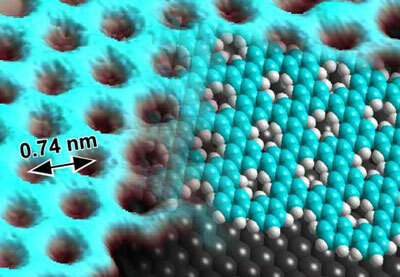 This created a porous form of graphene with pore diameters of a single atom and pore-to-pore spacings of less than a nanometer. Until now, porous graphene has been manufactured using lithographic processes during which the holes are subsequently etched into the layer of material. These holes are, however, much larger than just a few atoms in diameter. They are also not as near to each other and significantly less precisely shaped as with the “bottom-up” technique based on molecular self-assembly developed by the Empa and Max Planck group. In this process the molecular building blocks join together spontaneously at chemically defined linking points to form a regular, two-dimensional network. This allows graphene-like polymers to be synthesized with pores which are finer than is possible by any other technique.